How do I describe our week in Kenya? Exhausting, yet refreshing. Amazing, yet familiar. An excellent break from the “norm” in Kinshasa, without being too bedazzling we never want to leave. Vacationing with two small children is hardly a vacation in the traditional sense, but this particular week we had tons of help and we were able to enjoy nearly all of the amenities offered. However, we are also super excited to be home and get some rest! If you are as unfamiliar with Africa, geographically, as I am, then you will certainly appreciate the map that I’ve included. We flew from Kinshasa to Nairobi, Kenya’s modern capital. It was a three and a half hour flight. Traveling internationally is no longer such a monumental event as it was when we moved here to Kin. The immigration and visa paperwork is annoying, but at least we had plenty of help from the the other MAF families who were traveling with us to help watch the kiddos while we checked bags, filled out forms, and waited. And waited. Our flight was already an hour delayed before we even got to the airport. Ah well, this is Congo! We’re on Congo time! The kids did beautifully on the airplane. Levi sat for the entire flight, did not whine even once. He played with some cars, drew some pictures, and talked non-stop. We don’t own a DVD player and didn’t pull out the computer. See? He’s awesome. Amelia was happy to play with the three teenage girls of MAF families who I’m not sure how I would do life here without their help. After arriving two hours late to Nairobi, we quickly were transported to the guest house facility where we’d be spending the night. The drive through the streets reminded both Matthew and me of driving through the residential hills of Seattle, except in Kenya they drive on the left. It was dark, so there wasn’t much to see. 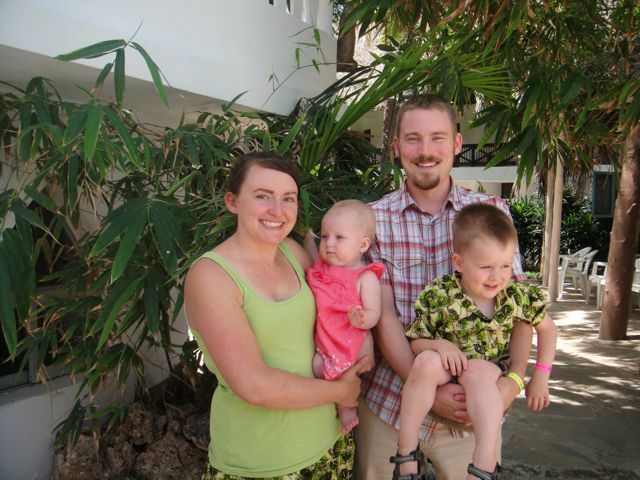 The guest house was a place just for missionary families passing through town. Many of the other MAF families from the three bases were already there. We got there just at the end of dinner service, ate quickly, and got the kids to bed. We were in a tiny room, but made it work as best we could. It was cooler in Nairobi than we were used to, but it felt so good. Some even wore sweatshirts! It was going to be an early morning, so after socializing a little bit with the adults we turned in as well. Very early the next morning all of the MAF families got into vans and headed back to the airport. We had a one hour flight out to the coast. After arriving at the tiny airport of this tourist town, we packed into more vans to head out to the resort. 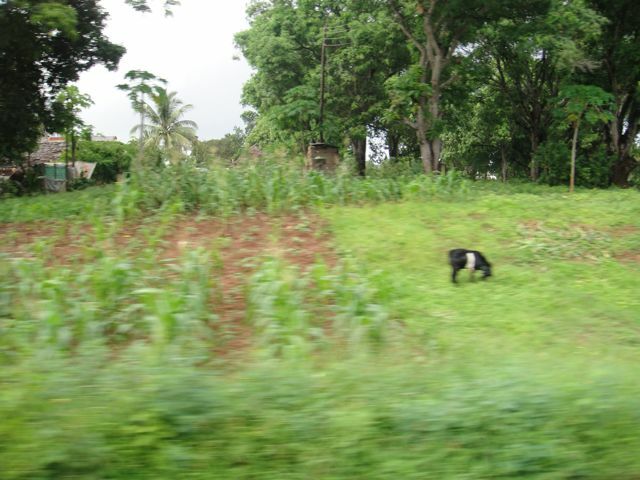 It was fun to see the Kenyan countryside and the way the locals lived. To compare it to life here in this giant city of Kinshasa is unfair, but there were many similarities. The building styles were different and there was a lot of livestock. Oh, and corn. There were huge cornstalks everywhere lining the roads. Since it’s the fall/early winter time here, they are nearing harvest time. So funny to see corn in a jungle! 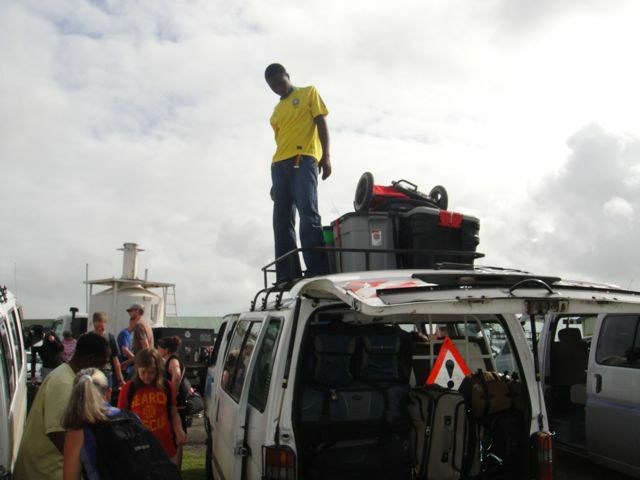 This is one thing Kenyans have in common with Congolese – luggage racks are used. A lot. And those are our bins and our stroller. 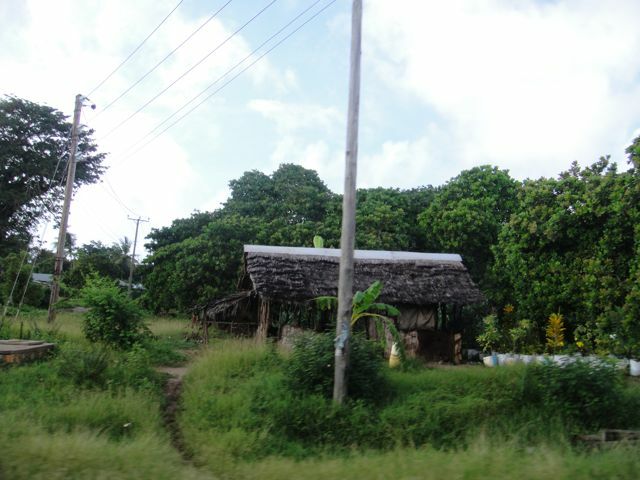 Taken from a moving vehicle, the roofs are thatched grass “panels” but are also water-resistant and very tropical-looking. See the corn? And the goat? Arriving at the resort we were greeted with quite the fanfare! The other MAF families that had arrived earlier were there, as well as drinks and cold towels for refreshing. We checked in, got our all-inclusive bracelets on, and headed to our room. Unfortunately, it was small and Matthew and I panicked a little. The night before, in the tiny room at the guest house, it had not gone well all being together in a small space, and we did not readily anticipate an entire week under those circumstances. However, the hotel was more than happy to upgrade us to adjoining rooms, which were also bigger. We settled into our room and headed out to look for some sort of breakfast food, since it was still only nine in the morning. The outdoor buffet, where all of the meals would be eaten, surrounded the main pool. Levi wandered over that first day and I watched as he introduced himself to some teenage girls in the pool and told them he was five years old. I laughed so hard. I know, I shouldn’t be laughing that he was lying to impress much older girls, but the kid is not even three…what a character! These girls happened to be part of the team that had flown in from California to lead our week. The purpose of this trip to Kenya was not just some R&R for tired missionaries (and a few, like us, who had arrived on the field just in time), it was for refreshment and encouragement. So, a team of a few pastors and their wives, along with some individuals, from the Rose Drive Friends Church in California raised the money to come serve us in this way. They led the worship, morning and evening sessions, youth and kids programs, and brought lots and lots of treats. Do you know how to bless an isolated missionary? Bring them Ranch dressing powder, brand name chocolate bars, and dried berries. This they did, and so much more. The girls did a great job giving the kids a great time while us adults were encouraged and filled in the sessions. We talked about challenges, living lives of constant change, our purpose on the mission field, and many other topics. Each session was made more intriguing because of drawings for aforementioned goodies and freely passed-out chocolate. But, we always make an effort to put God at the center of what we do, our focus, and this week we were reminded how and why that works best. 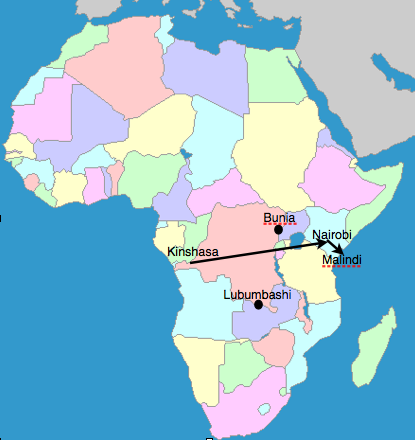 It was also a time to meet the people from the other DRC bases in Bunia and Lubumbashi (see map above). There were several families from the other bases with small children, so I was so excited to hear about their lives and how they handle it with little ones. Those are some brave women! Their lives out in the bush of DR Congo make my life here in the big city seem easy. Between the morning session and dinner we had free time. Levi loved the pool, as did Amelia. Matthew enjoyed a daily afternoon water polo game. We also spent time eating more food, poking around on the beach, and enjoying the kids’ nap time as a time alone for us. Because the resort was environmentally friendly, they did not clear their beach of seaweed and it was seaweed season. So, we didn’t spend too much time out there. Enough to stick our toes in the Indian Ocean and feel its warmth! 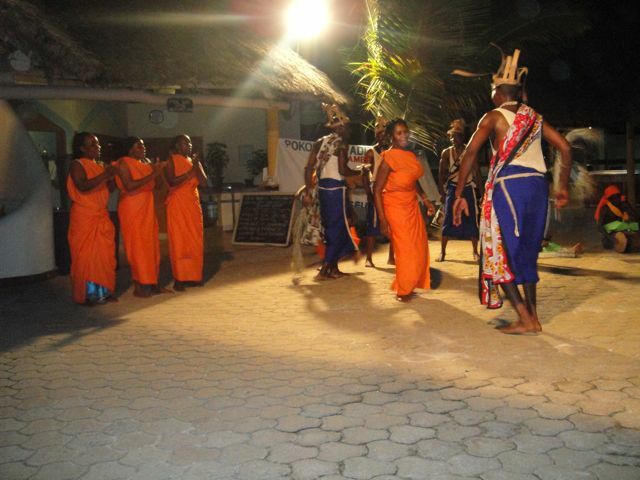 Nightly at the resort, there were local shows. This is a traditional wedding dance. 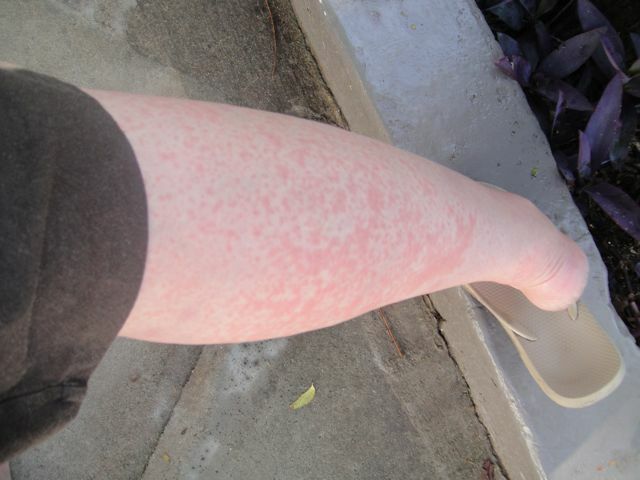 On Monday, my leftover rash from my Chikungunya suddenly decided to come back with a vengeance. It became painful, like an awful mix between a sunburn and a mosquito bite. It was hideously ugly, too. I finally broke down and took Benadryl, which of course knocked me out cold, but I was too uncomfortable to be awake anyway. Thankfully, it was better by Wednesday, though my ankles continue to be swollen and sore even now. 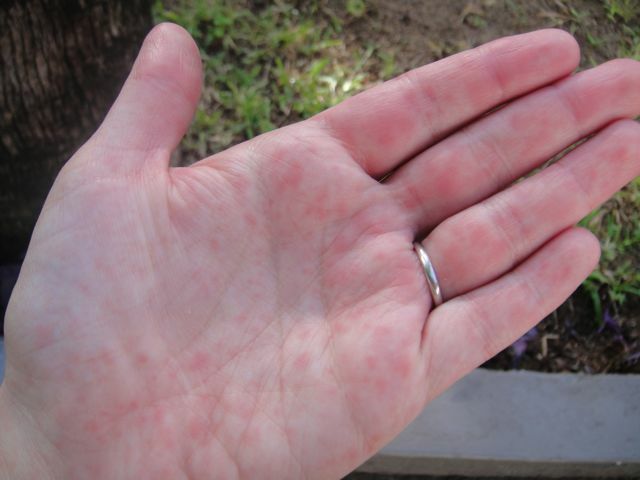 The rash crept onto my palms and the bottoms of my feet, making them itchy. So awesome. Matthew said the rash felt reptilian. Again, awesome. That first day I was hanging out in the room, unpacking a bit, and letting Levi nap when I heard a racket in the trees. “Goodness, those birds are noisy,” I thought. When it continued, I stepped outside on the porch. Not birds, monkeys. 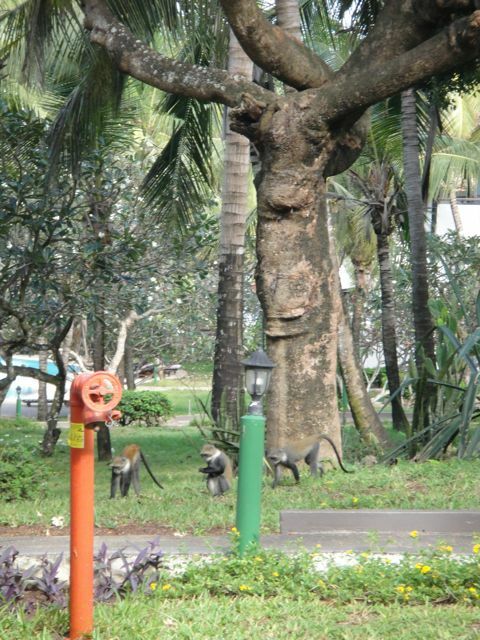 Of course there would be monkeys in the trees in Africa, right? And so many interesting bugs. 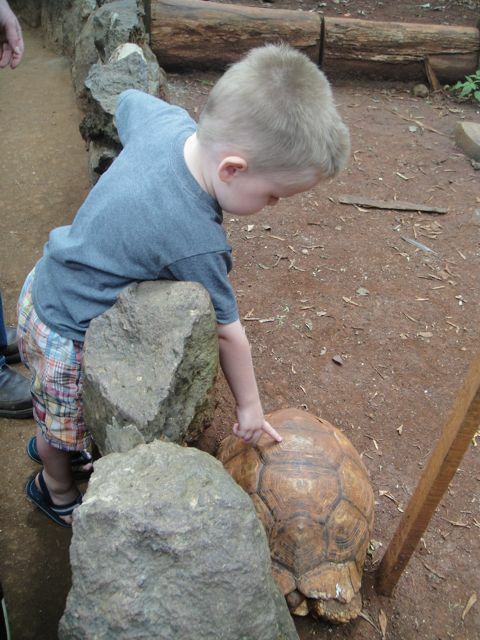 So much more interesting than the bugs in Kinshasa. Brightly colored things, giant praying mantises, millipedes several inches long and nearly an inch across that looked prehistoric, and then there were the crabs. Somehow, these crabs would get all the way by the hotel rooms. I did a dance with one trying to get back to my room, using my dress to scares it away. It really didn’t work. Finally I just charged at it when I heard other people coming and I didn’t want to look stupid, fighting with a crab. Thankfully, the bugs and crabs stayed out of our room! One highlight was getting to go snorkeling over a reef. Not being a confident swimmer, I stayed in the boat for the most part because this day was especially windy. I did enjoy feeding the fish, since they were eating right out of my hand. Matthew, on the other hand, spent the entire time in the water and was able to see some pretty neat wildlife only before enjoyable during a viewing of Finding Nemo. Friday morning was filled with good byes as most of us and the Rose Drive Team headed back to the airport. It was time to get back to real life in Congo, but Matthew and I were ready to get home and get right back into the work. We really do love it here! However, before we could go home, we had a long layover in Nairobi that we weren’t about to waste. Mt. 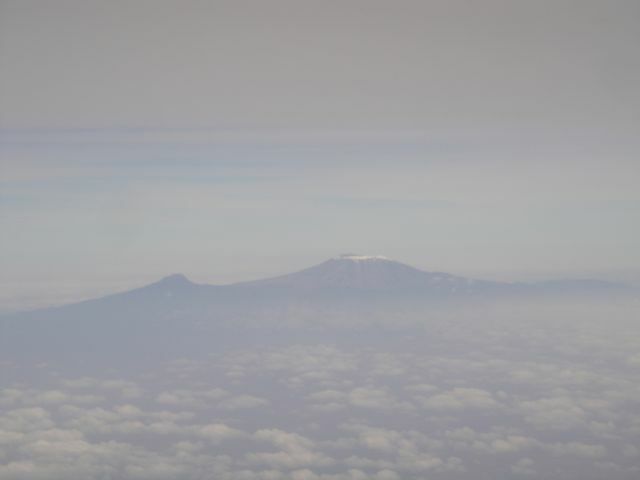 Kilamanjaro as seen from the airplane – the highest peak in Africa! Ok, much of it was wasted sitting in traffic. Nairobi has some of the worst traffic on the continent and it really rivaled any that we experienced growing up in Seattle. But, our first stop outside the airport was a giraffe park. 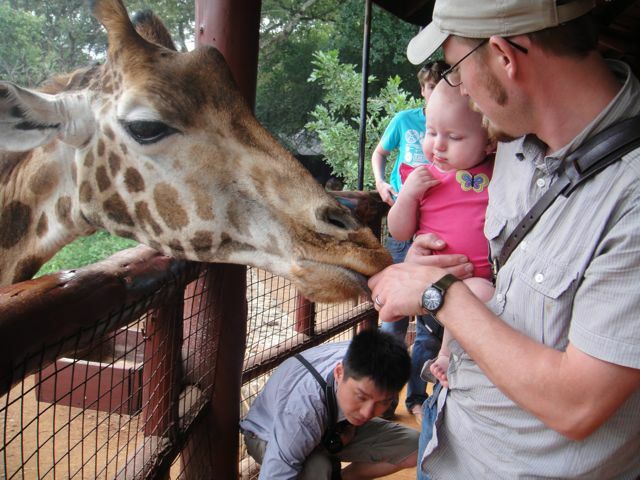 We each got to pet a giraffe and feed it a pellet. If one desired, they could put the pellet in their mouth and get a kiss. We are not that lonely, though. 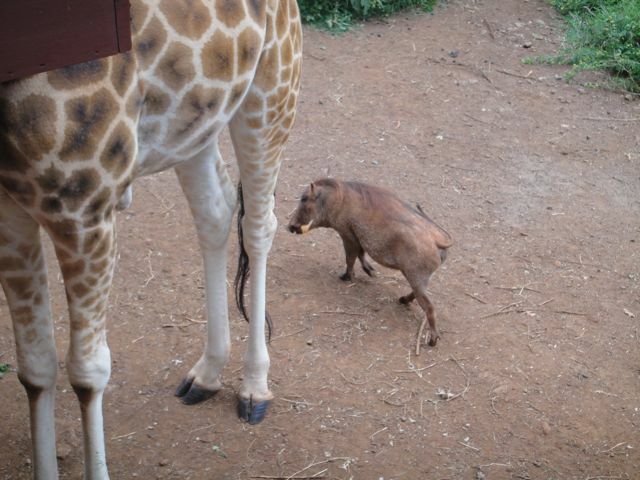 They also had some warthogs and tortoises roaming about. One other perk about being in a big, modern city like Nairobi was the presence of malls. Lots of them. We only had time for one, so we stopped and sped through it. It was just like any mall in the states, even some of the chain stores were the same. They had a great store with adorable baby clothes, but at big city mall prices, so I did not splurge on what I did not need. We finally found a place to get Amelia’s ears pierced. It was something we had wanted to do before we left the states, but weren’t sure about conditions in Kinshasa. Once we found they were fine, but not wanting to get the actual piercing here, we were happy to do it while in Nairobi. The place was very clean, though an interesting mix. The front part of the store looked like any beauty store in a mall: make-up with people to put it on you. The next room was a salon, with hair and nail stations, even pedicure chairs. Then there was a dark hallway for piercings and tattoos. Why not? All the vanity you could want in one place, I guess! But, it was clean, they used sterile procedure and it only cost $6. Finally, it was time to speed back to the airport (ok, sit in traffic for an hour…) and get home. More paperwork and checking our last bag full of souvenirs (the rest had been checked all the way from the beach), we got through immigration and security. We found some food on the run at the terminal and directly boarded the plane. 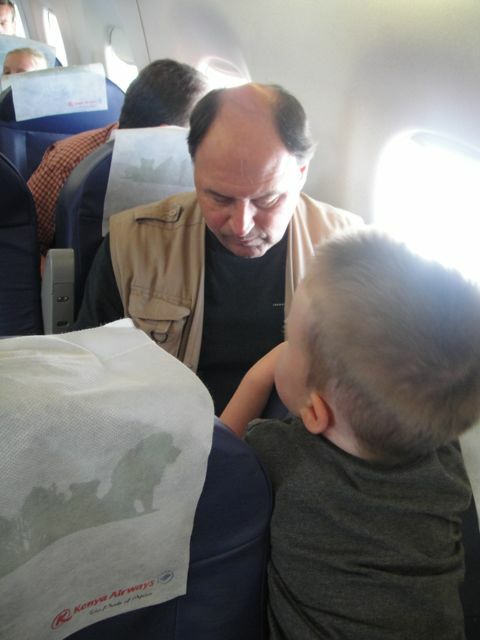 Sure enough, something broke and we sat in the still aircraft for an hour…at the kids’ bedtime. Ugh. But, they both finally fell asleep and it was a relatively uneventful flight back to Kinshasa, landing at 11pm local time, 1am body time. We waited for over an hour only to find one of our bags and a bag of another MAF family had not arrived. It turns out about 30 bags from the flight had not made it. We prayed hard that it would arrive, I even sent out a request on facebook. Two days later the bag finally found its way to Kin and it was completely untouched! We are praising the Lord for that small miracle! I cannot imagine replacing the items, mostly clothing and shoes, in this city. We have spent the past three days sleeping, or so it seems. We got pretty tired trying to figure out how to best get the kids to sleep, so we were thankful to get back on a holiday weekend and have three full days for recovery. (No, not the 4th of July, the 30th of June…DR Congo’s Independence Day!) We are pleased at the work that was done at our house while we were gone and even contemplating a move back sooner than expected, because the power situation there has been better than at the apartment the past few days. So, now we dive back into life here in Kinshasa, feeling refreshed with some awesome tans for Levi and I (Matthew just burns and Amelia was always well protected). We are praising God for a chance to see some more of this awesome continent and an even greater chance to refocus on Him and what He would have us do during our time here! We miss you guys but love seeing all you get to do from afar!